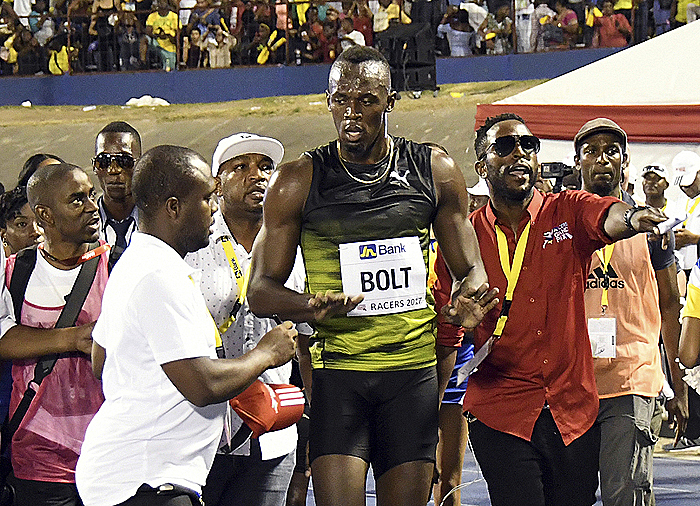 KINGSTON, Jamaica (AP) — World record holder Usain Bolt has bid farewell to the tracks of his native Jamaica, winning a 100-meter race amid fireworks and honors. Some 30,000 people attended the JN Racers Grand Prix race, labeled "Tribute to a Legend." Among them were IAAF President Sebastian Coe and Jamaican Prime Minister Andrew Holness. The IAAF website quoted Coe as saying he was there "just to thank someone who has changed the face of our sport, and has encouraged so many young people to our sport." Bolt finished Saturday night's 100-meter sprint with a time of 10.03, well short of his nearly eight-year-old world record of 9.58., but equal to his first 100-meter race 10 years ago. The 30-year-old Bolt is the only runner to win gold at 100 and 200 meters in three consecutive Olympics. Holness tweeted: "Saluting a legend. Thank you @usainbolt for all you have done for the sport of athletics and Jamaica."